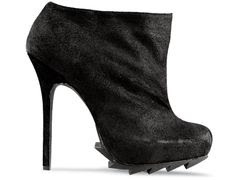 Camilla Skovgaard's saw mule retails for $395 at Blue and Cream. Jeffrey Campbell's Fang bootie is a great option for those on a bit of a budget, and they retail for $121 at Lulu's (also available at Nordstrom for $124.95). Click here if you're interested in purchasing. *Update - 7/7/10* - Reader Alice emailed me this second option (although not peep toe) by Senso which retails for $169.95. Click here if you're interested in purchasing.